That our food was delicious. 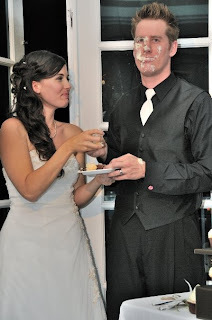 That our wedding cake was unique and so very tasty! Back in 2008 wedding cupcakes were just starting to take off and hadn't really been seen or heard of. We had been to quite a few weddings during our dating years, and none of them were cupcake weddings. 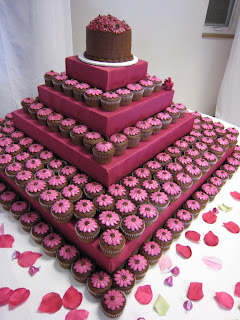 Now I'm not saying there is anything wrong with having a wedding cake- in fact there is something very traditional and sophisticated about doing it the way MANY brides and grooms have done it for years before! If it works, why fix it, right? My wanting to have cupcakes as our wedding cake stemmed purely from my love for cupcakes. 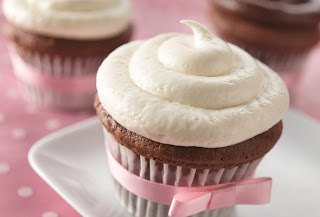 Let me rephrase that- I was obsessed with cupcakes. I loved making them, talking about them, seeing them, and of course- eating them. I loved researching and finding new and exciting bakeries, then trying them out. I loved surfing through the internet or bridal magazines looking at what modern brides were trying out! My then boyfriend/fiancée knew that he could brighten up my day with the simple question, "Would you like to get cupcakes today?" 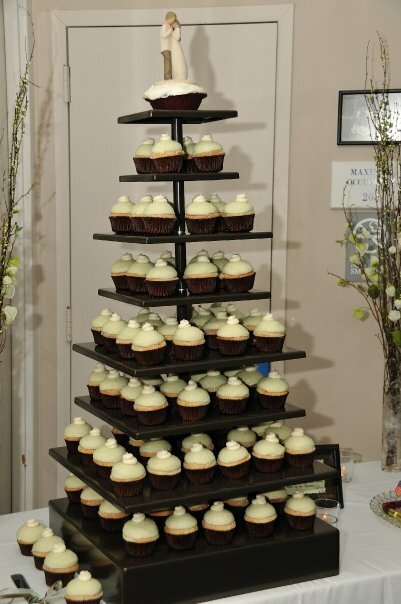 Here was the problem...other than Sprinkles...where the heck could I get fabulous cupcakes for our wedding? Not only did they have to look totally awesome, but I wanted them to taste even better! One day I was flipping through my huge pile of wedding magazines looking for inspiration when I stumbled upon a little teensie advertisement for a "new and upcoming" bakery, Vanilla Bake Shop. "Alright, let's go try them out" I suggested. As soon as my fiancée and I arrived at their little shop in Santa Monica, I was hooked! It was a gorgeous little shop, right up my alley in style and feel. We met with Amy Berman, the owner and head pastry chef for our wedding cupcake tasting. After a little chit chat we found out that we had both attended the same culinary school, her having graduated just a few semesters ahead of me! We talked about some of the same people we knew and after some time went straight to business. It was cupcake eating time! And....my fiancée and I were in love. 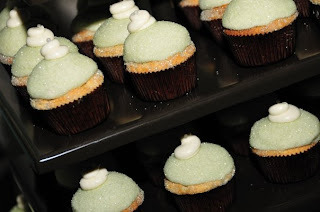 We decided on their vanilla bean cupcake with vanilla bean buttercream topped with sage green sanding sugar to go along with our wedding colors. 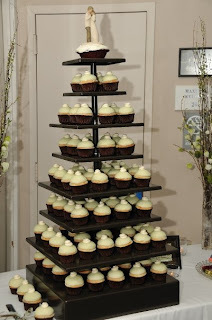 We also chose a chocolate brown wedding cupcake tier to hold all our cupcakes..I couldn't wait!! 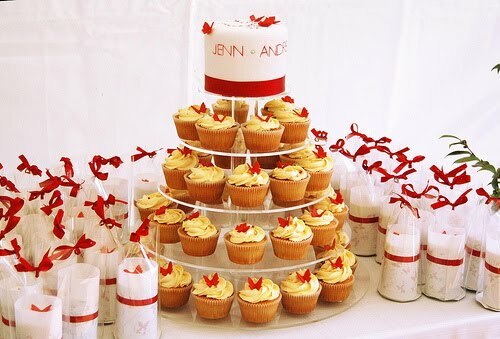 Our wedding cupcakes and tier! Closeup! These were SO tasty! If you are in the market for some absolutely delicious cupcakes, I would highly recommend this "little cupcake bakery"...they've sort of exploded a bit since then! 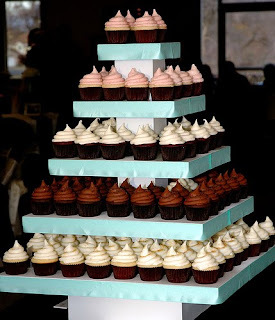 I've had a few brides come to me about having cupcakes at their wedding- it seems they all have the same sort of worry- is this doable? If so, how? And...will it look as stunning as a wedding cake? My answer is always: Yes!! Yes!! YES!!!!! 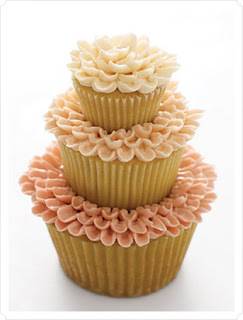 Not only are wedding cupcakes doable, but they are so very easy. Most bakeries offering cupcakes also offer tiers for you to either purchase or borrow (as in our case with our wedding- we rented their tier). The amount of work is up to you- do you want a more simple look? Or are you looking for a more extravagant look? Do you want a more rustic looking tier or more sophisticated? 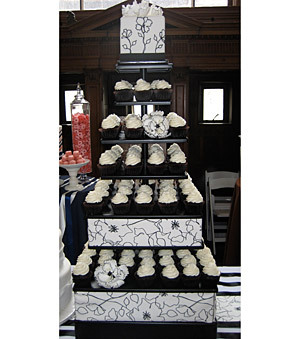 Any bakery will be more than happy to work with you..adding embellishments, ribbon...etc to their tiers or what have you, and make sure your tier goes with your wedding theme perfectly. If you're looking for a very custom decoration, our Edible decorations are always a nice way to make sure your cupcakes look exactly the way you want, and ribbon or lace is always a wonderful way to make sure the tier is just as nice. Please don't feel limited to what we've shown...we are absolutely up for custom orders and love (and encourage) creativity! As I was reminiscing about our wedding day and wedding cupcakes I started browsing through others' blogs looking for some really gorgeous cupcake ideas. I just have to share with you some I found!! I hope they inspire you as they have, me! There's no need to really say just how fabulous Martha Stewart's cupcakes (cakes, pies, cookies, paint, house decorations, pets' clothes, etc etc etc) can be. That woman has some real talent!! 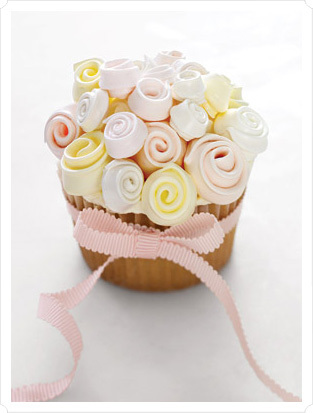 Another unique way to make your wedding cupcakes look totally beautiful is in the wrapper! There are some gorgeous wrappers out there! Like I said earlier, if a simple look is what you're going for- a little ribbon wrapped around the bottom of each tier is all it takes! 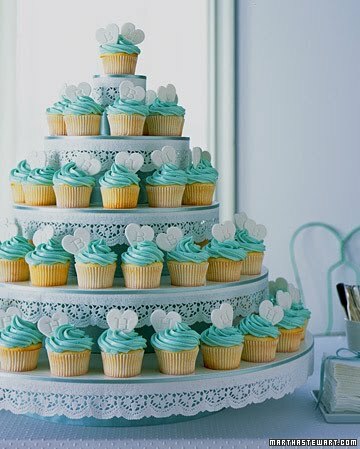 If a more embellished look is what you're going for, this tier from Vanilla Bake Shop is just for you!! I just love this one!!!! So to all you brides out there- do whatever your heart desires! 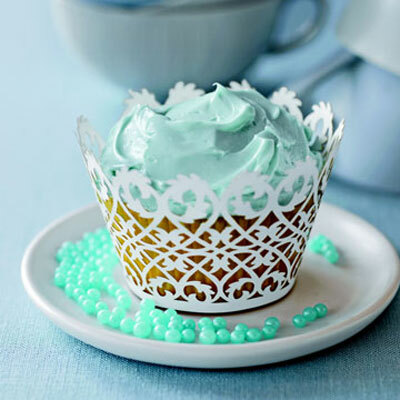 If it's cupcakes you want, cupcakes you'll get! Be as creative as you want! I can't wait to hear from some of you!! Let's get creative! facebook. twitter. bloglovin. google+. instagram. pinterest.